Doing a google search on that phone number (414 6457500) turns up an interesting link of businesses withsic code 3111, a list of tanners, suppliers andpossible producers et al. http://www.webstersonline.com/sicresults.asp?siccode=3111Regarding the issue of getting into the sewn productsbusiness, as useful as I found _The E myth revisted_I'd be remiss in failing to mention _TheEntrepreneur's Guide to Sewn Product Manufacturing_ aswell as Fashion-Incubator.com. That search sure turned up a lot of tanners andfinishers, including a few in Gloversville. I should have mentioned Kathleen's book sooner. The emyth book is way simplistic by comparison. It just gets you thinking about your business as a finished work and tells you how to reverse engineer it right from the beginning. I actually mentioned it because it is so cheap and easy to read. If the guy would just SAY IT, it would be a one chapter book. Entrepreneur's Guide to Sewn Product Manufacturing has a lot more specific info. You want more it costs more. I'm not trying to sell books here but... it's something to consider. Oh, and don't go to her blog unless you have a lot of time to spend, you'll get hooked and read for an hour or two. I happened upon this book one day & hesitated to pay $60 for it...now I laugh at myself for thinking:a)$60 was a big investmentb) i could "learn" my way without it Now that I have read it...and highlighted it...and consulted it time and time again, I realize it was the smartest $60 I have spent in my time in the industry. I have run the gamut-- from "how-to" and "fashion design" books to contractors, business "partners", and bad samples...NOTHING has been better for me or my business than THIS BOOK. Think I'm over exaggerating? This book is absolutely priceless if you are starting out in the industry and THINK you havea handle on how to do it. You don't. You think you do, you think you're close enough, but you are wrong! I can say all this because I made so many mistakes until I got my hands on this book. I cannot tell you how many times over the years I have caught myself saying, "Kathleen was right! ".An invaluable book. Worth ten times the price-- but please only buy from Kathleen directly! This is one of the hardest-working ladies in the industry who takes her valuable time to answer newbie (like me) questions in person. What a wealth of info! What a resource! I have a LIBRARY of sewn product manufacturing, design, and production books, and NONE have been worth the price-- until this one. Oh-- I took the courses in college, too, FYI. I'll say it again-- the book has proved more valuable than all my years studying at an uppety, private university! Well... hard to beat that review. After I published this a guy from ...@Princeton.edu sent me 3 emails wanting me to unsubscribe him. I had to email him twice that there was an unsubscribe link at the bottom of every message, and if I did it, I would unsubscribe myself not him. Guess he didn't like the "uppety, private university" part, but he did kind of validate the reviewer. I told more about that to the guy in India in the post before this one. What you want is someone who can do it as a subcontractor. The way I am doing it now is to train someone and set them up as self employed. You need to read the book the e myth revisited that I recommended before. My problem is that i don't have sales. I try a lot but i do not find genuine customers. Let me know what can be done. I guess you have to make different stuff and find someone who can sell it. Probably the easiest thing to do is find someone who is selling stuff and make stuff for them. I did that years ago. 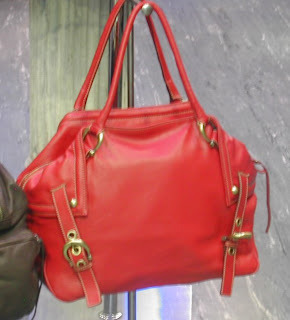 There was a company that I was buying handbags from, to sell in my store. I would visit thenm every few weeks and pick out what I wanted from their inventory. They bought leather in big lots, that I was unable to do. I started buying some leather from them. They were good to me and sold it at their cost or maybe a little more. They sold me thread also. I was in their factory and it got so that they would sell me whatever supplies I wanted. I also learned a lot about how they made things. What I was making then was really crude handmade stuff. Tooled handbags laced together with rawhide. I had a sewing machine but that was about it. I saw what a skiver could do and wanted one. The factory foreman found me a used machine. I started making better stuff. I bought a clicker and needed dies. There was a die shop near my store... Quality steel rule die Co. They made dies mostly for cutting out cardboard boxes. The box business was big in town at the time. All kinds of boxes with printing on them. Anyone who makes stuff has to have a box to put it in. Well the owner was good to me and let me make my own dies in his shop. I didn't really have any money in those years. That's how I learned to do that, though I do them different now... welded, without the wood that is used in steel rule dies. I learned what equipment is used to bend the steel rule and managed to get it for my own shop. I learned about welding over the years and knew what I would need to weld the steel rule. The welder was the most expensive part of that operation. So then what I did was to make a clutch wallet as a sample and showed it to the owner of the factory where I was buying the handbags... made out of the same leather he was using. I suggested adding it to his line to sell with the handbags. He liked the idea, it used small parts and he had a lot of scrap from the handbags. He would cut out the wallets and send them to me to be made. It is called "contract labor", he just wrote me a check for it... he called the scrap "free leather" as it was paid for by the handbags and it was something that kept his clicker operator busy when there was nothing else to cut out. I started making other stuff as well, like cigarette cases. That gave me enough steady business that I could hire people to sew, and have them make stuff for my store also. The editor for this blog is driving me nuts. It reformats everything when I publish it to the internet. I haven't posted anything lately. Here is my excuse... besides being overloaded with work, I've been to Italy for a couple weeks. 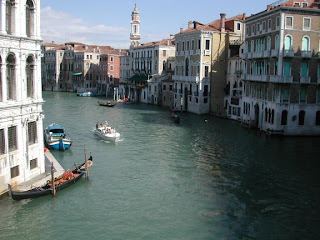 What trip to Italy would be complete without a picture of the grand canal in Venice? So here it is.Actually Florence was a bigger highlight with so many sights to see, as well as being a center for the Italian leather industry. 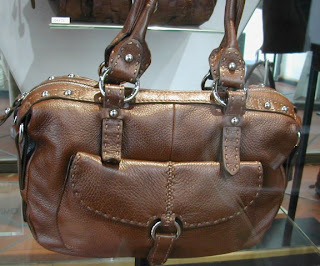 Here are a few interesting Handbag treatments I saw. These two bags are interesting because the pattern is really simple and rectangular, then the bag is twisted into another shape. 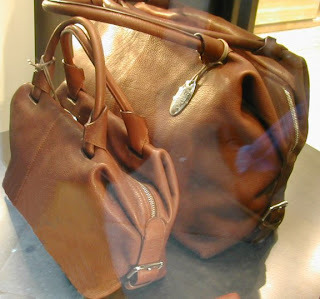 The strap attachment on the brown bag is really interesting . This bag has a feature I've only seen on luggage. You would think the teeth on the bottom would scratch furnature, nice leather though. On this one the interesting strap attachment doesn't save it from being just plain ugly. 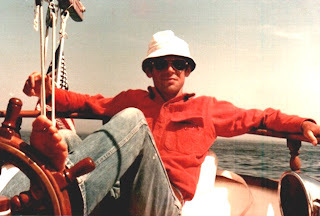 This blog will eventually replace the Leather Goods Connection Yahoo group. Today I'm making a few belts, a couple wallets, the Equestrian handbag in a larger size, and the large equestrian bag with camouflage lining. Not many people have ordered that lining. I thought it would be more popular... kind of your own little secret inside, the way we had dragons embroidered inside our navy pea coats when we were in Japan. Yesterday some wallets and a couple backpack samples came in from Impex. They are made in India and warehoused in TX. The backpacks only come in Black and are sold in units of 24 per style at a price of $55.00 each. The wallets cost $8.75 each and come is units of 300 with 200 black, 50 brown, and 50 tan. The backpacks actually look good and appear to be what you get when using better leather to start with. A cynic here suggested that those were made to be samples and they may not run that way all the time. The wallets have a lot of pockets and zipper compartment and are what you expect from an import. I'm not going to get involved with that stuff. I think I'll send the samples to Mark Mowen, it's more his kind of stuff.